Lately I’ve been going over software that isn’t new to me; things like wyrd-and-remind, crawl and even wordgrinder are established titles in the Linux text-based software landscape. Here’s something that’s not new, but not old, but not … new at all, really. That’s fdclone, an ancient (and by that I mean 1995) file manager with a largely Japanese user base. Skimming through the readme file will explain that fdclone is a knockoff of an even older DOS-era file management tool called fd, dating back to 1989. If I understand correctly, fd itself was so popular that the initials became synonymous with file management software. Be that as it may, I first found fdclone a few years ago, and like a lot of file manager variants, it has points that I like and points I don’t like. As you can see it has a two-pane arrangement, expandable to a tree. It makes use of the function keys for esoteric functions like decompressing or sorting, and uses colors to quickly pick out groups of files. 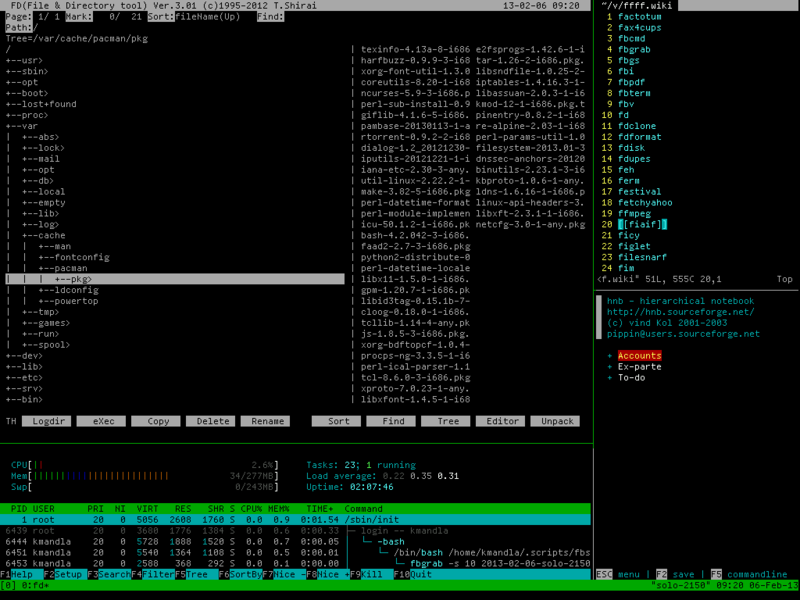 It’s fast at the keyboard, especially for things like changing the sort order or executing a shell command. It has an onboard editor and a find function. There’s not much that it can’t do, and it does it in a very light fashion — taking up only one-half of 1 percent of the 256Mb I have in this machine. Like any file manager (or any software, for that matter), fd takes a short time to get used to. It’s worth trying at least. This entry was posted in Linux and tagged file, manager on 2013/03/16 by K.Mandla.